This book was completely different than anything I’ve read lately, or maybe ever. It’s the story of Nita, a girl who has grown up working in the family business. Only this family business is much darker than normal; they capture magical creatures and dissect them in order to sell their parts on the black market. And Nita is the one doing the dissecting. But she doesn’t murder them, her piece in the business is methodical and precise and has never bothered. That is of course until her mother brings home a live person for Nita to dissect. In her effort to do the right thing and release the man, Nita herself is sold on the black market and gets to see her world from a much different angle. This book gets DARK. So if you aren’t ready for that, or for slightly gruesome dissections, maybe skip it. But, dark is kind of my thing and though some things made me a bit squeamish, I still really loved where Rebecca Schaeffer went with this book. It brings up questions like, what does it mean to be a human? As well as lots of other social commentary sprinkled throughout. This is very much a story where the main character walks the line between hero and villain. Nita is fantastic and I loved being inside her head. I’ve heard Not Even Bones pitched as Dexter meets This Savage Song and I couldn’t think of a better way to describe it. It just so perfectly encapsulates the darkness of humans and what we choose to do with it. 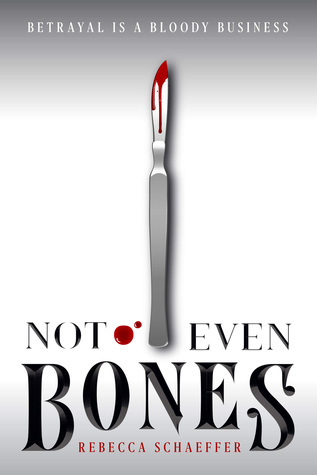 Synopsis: Dexter meets This Savage Song in this dark fantasy about a girl who sells magical body parts on the black market — until she’s betrayed. Thank you so much to NetGalley and Houghton Mifflin Harcourt for letting me read and review this book! I really want to read that book now. I’m definitely adding it to my TBR.